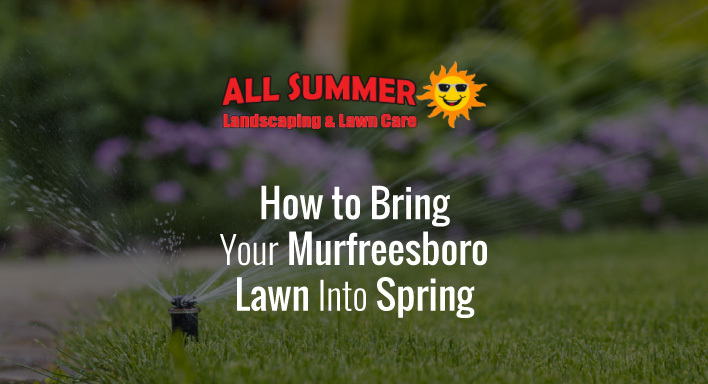 As the temperatures continue to warm, everyone in Murfreesboro will want to start spending more time outside. Kids will be playing, parents will be grilling, and your lawn needs to be ready for Spring. There are a few things your landscaping company will need to do in order to bring your lawn fully into the season. The first step is to pick up any leftover leaves, sticks, acorns, or other debris that are still on the lawn. Over the winter months, debris may have built up even if you raked leaves regularly. Leaves and other items can impede proper growth in your flower beds and even grass. Before bringing your landscaper in, you need to know what you want your lawn to look like. Do you just want perfect green grass? Do you want a new design for your flower beds, or to improve existing beds? Look around the internet or magazines for inspiration so you can know exactly what you want your landscaper to do. If you have decorative landscaping, you will need your beds freshly edged. Edging helps make sure that grass and weeds don’t make their way into your beautiful flower beds. If you do not have any decorative landscaping and want it, have your landscaper cut new beds. Decorative landscaping can add a lot of appeal to a home or business’s external appearance, but it is of course not necessary. Mulch is essential to help soil retain moisture and to fight weeds. Have your landscaper lay fresh mulch where necessary. Different types of mulch are suited for different lawn needs. Your landscaper will be able to tell you what variety of mulch is best for your Murfreesboro lawn care needs. Give us a call at All Summer Landscape Group, and we’ll help you bring your home or business’s lawn into spring!